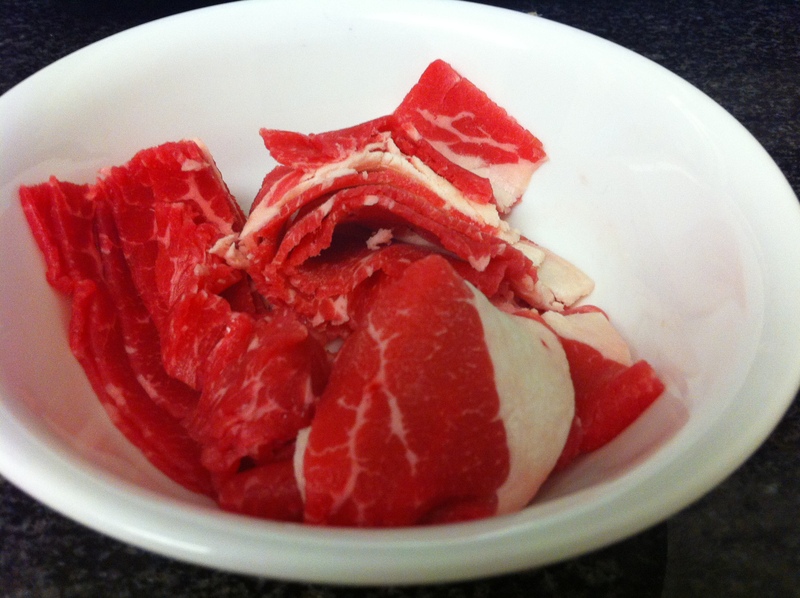 Chadolbagi (차돌박기) is paper thin brisket that is a popular cut of beef for barbeque. It is not marinated but simply grilled and usually served with a side of sesame oil with salt and pepper, variety of lettuces and ssamjang (쌈장). At least once a week, my friends and I used to go a restaurant called Chaldol-jip (차돌집) that specialized in this piece of meat when I lived in Seoul. After several servings of grilled chadolbagi, we always finished the meal with Chadolbagi-duenjang-jjigae (차돌박이 된장찌개) and rice, which was actually the best part. This version of duenjang-jjigae is richer in taste than the traditional duenjang-jjigae made with myulchi (멸치, dried anchovies) broth but is simpler to make. 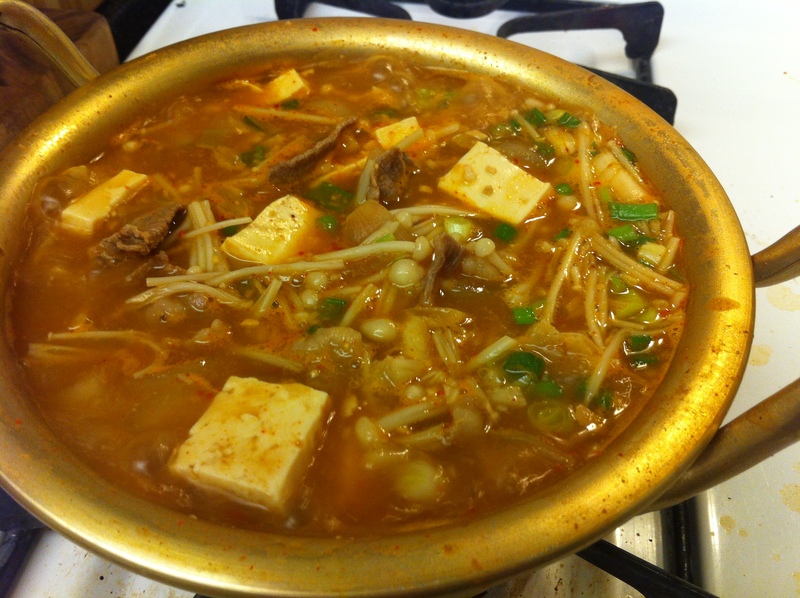 My husband and I actually prefer Chadolbagi-duenjang-jjigae. 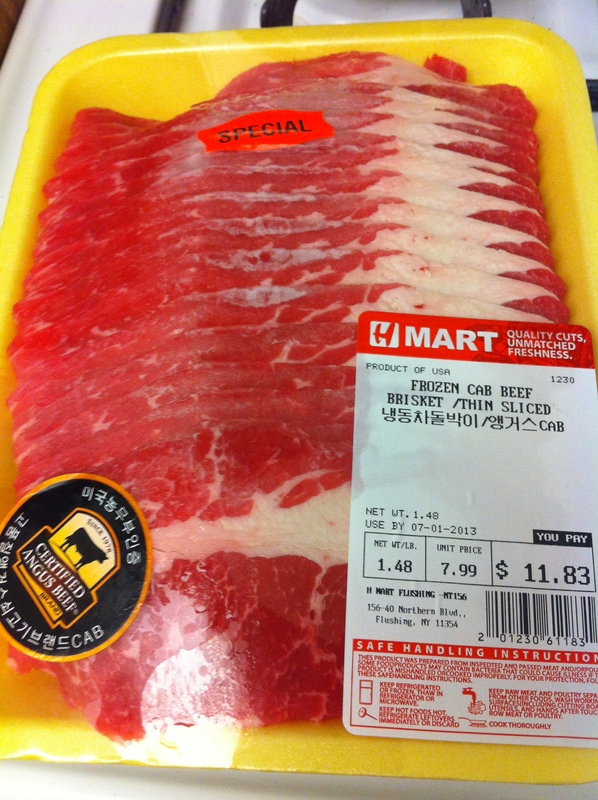 If you cannot buy this cut of beef at the Korean supermarket, you can substitute it with Japanes shabushabu beef or ask your butcher to cut a fatty part of the beef, paper thin. 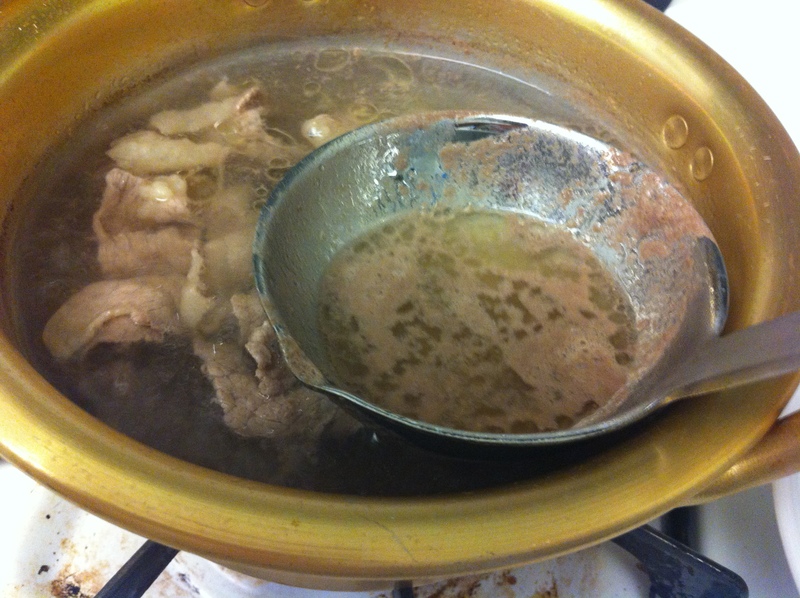 Add the beef to the water in a pot. Bring it to a boil. 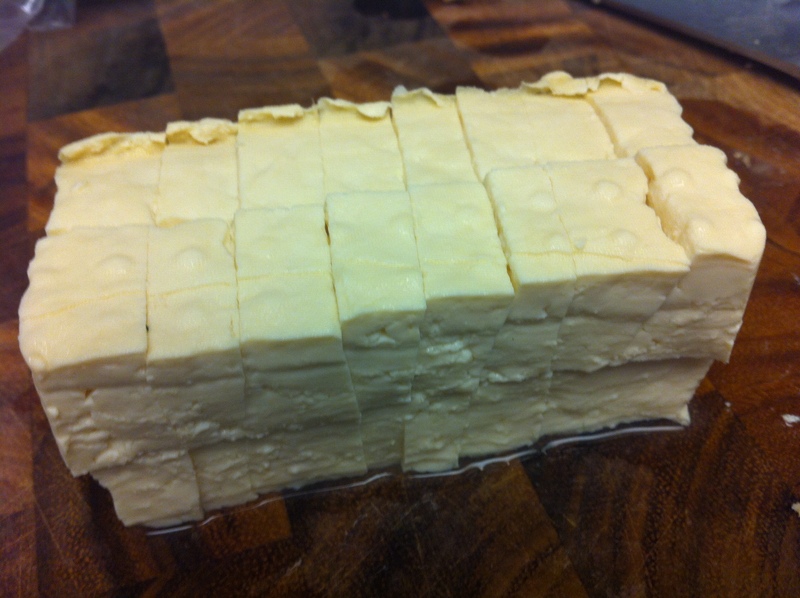 In the meantime, cut vegetables and tofu. When the water comes to a boil, skim off the fat and foam. Stir in the duenjang (된장, soybean paste) and gochujang (고추장, red pepper paste). 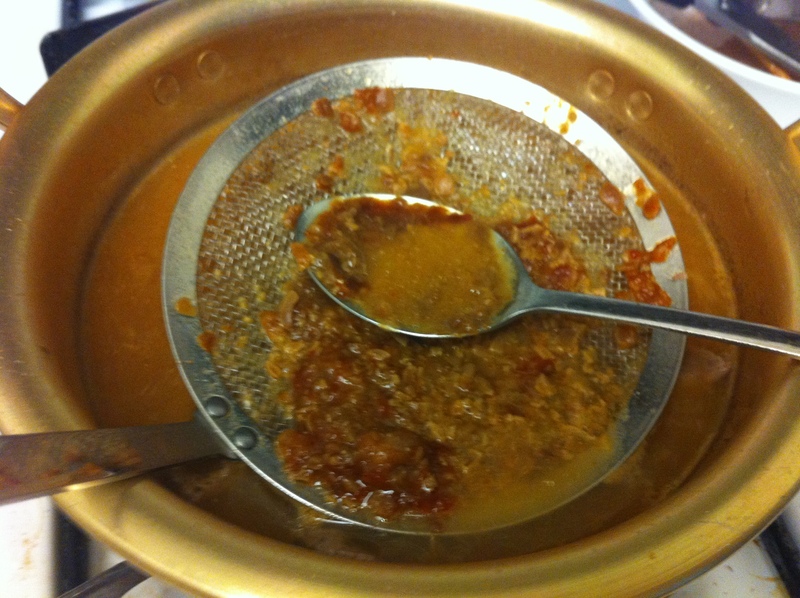 I like using a small sieve so the pastes dissolve more easily. 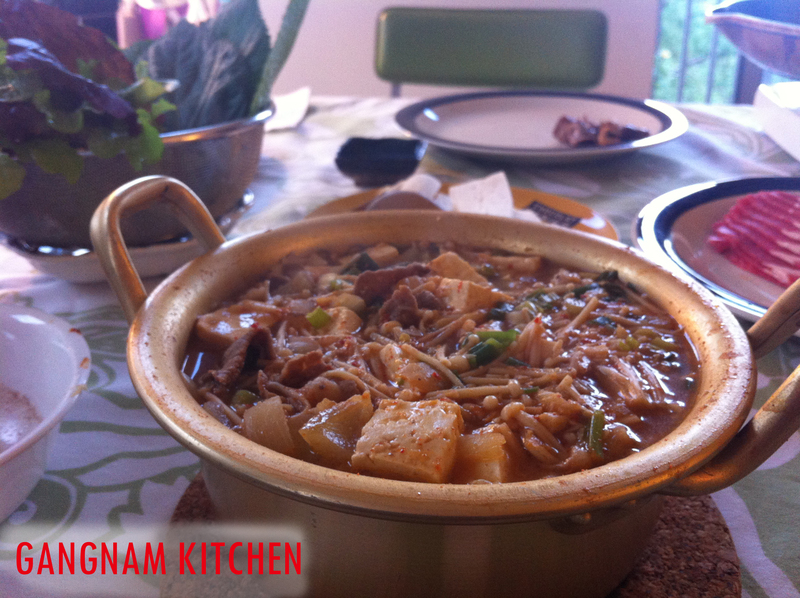 I also like adding a little gochujang to my duenjang-jjigaes to enhance the taste of duenjang but this is optional. Add the vegetables and tofu. 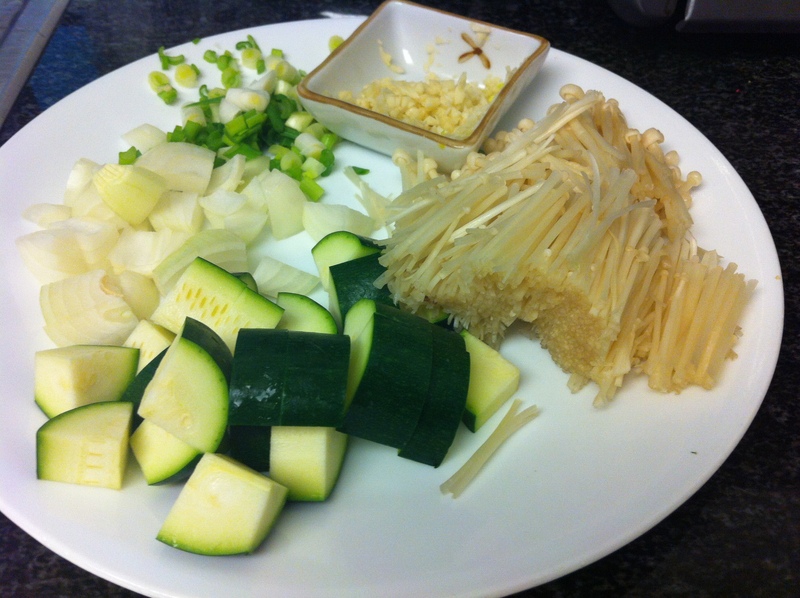 When the onion and zucchini is fully cooked, add the rest of the ingredients and cook for a few more minutes. Gochugaru (고추가루, red pepper powder) and green chilies are optional, depending on how spicy you like your dishes. 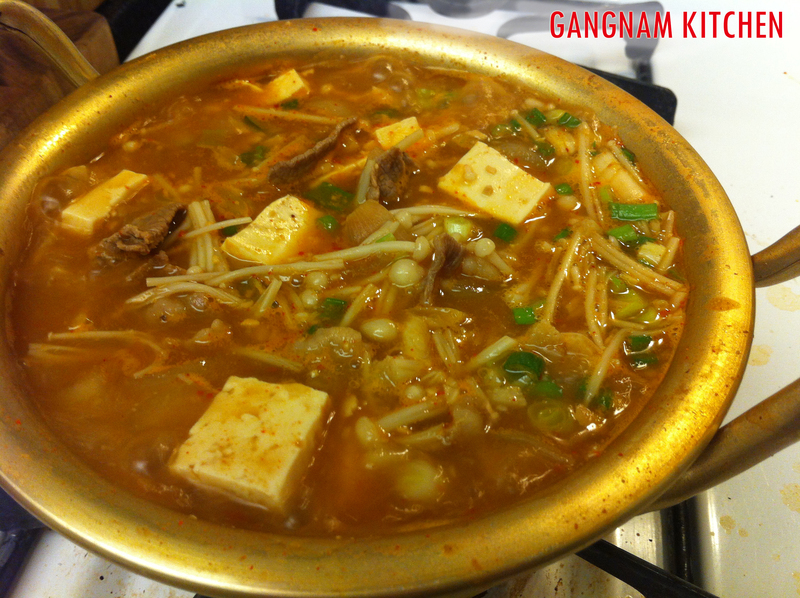 This entry was posted in Good for dinner, Good for lunch, Meat/Chicken, Soup/Stew (국/탕/찌게) and tagged Beef, Chadol-bagi, Duenjang, Jjigae, Stew by gangnamkitchen. Bookmark the permalink.